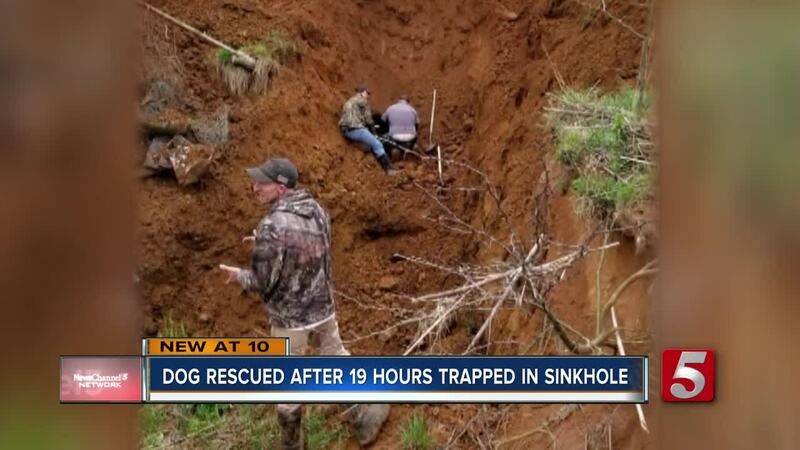 NASHVILLE, Tenn. (WTVF) — A beloved family dog spent a harrowing 19 hours trapped in a sinkhole in Robertson County. It was off a rural road in Robertson County this weekend, where man's best friend needed a little help from man. Out chasing raccoons for exercise, Phillip and Brandi Harrison's dog Annie made her way down a sinkhole and couldn't get out. After staying until 2 a.m. Saturday trying to get her out, Phillip and Brandi Harrison returned at daybreak. Help came in the form of the Robertson County Special Ops division, and a neighbor with a track hoe, that eventually managed to free Annie, trapped inside the hole. "She was very lucky to have people to help her like they did," Brandi said.